Pair of fauteuils, of walnut, each having a padded, square, molded back accented by a small floral carving, the outward-curved arms, ending in scrolls, and raised on down swept terminals, flanking its crown seat, the bowed seat rail carved with similar flower, and flanked by rosette blocks, raised on square-section tapering legs, in-carved with foliate design. CONDITION: Very good. Sturdy chairs with desirable wear to finish. Some wear to upholstery. 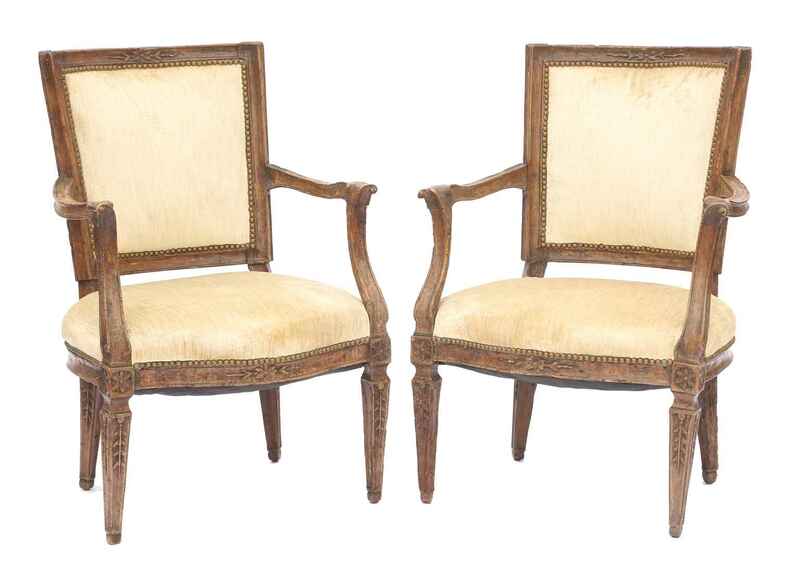 Pair of fauteuils, of walnut, each having a padded, square, molded back accented by a small floral carving, the outward-curved arms, ending in scrolls, and raised on down swept terminals, flanking its crown seat, the bowed seat rail carved with similar flower, and flanked by rosette blocks, raised on square-section tapering legs, in-carved with foliate design. SEAT HEIGHT: 17" CONDITION: Very good. Sturdy chairs with desirable wear to finish. Some wear to upholstery.